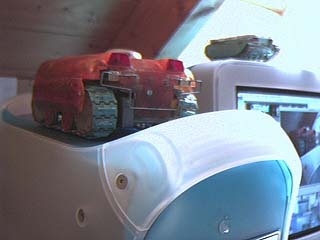 Attention: An autonomous mobile robot page just for fun. 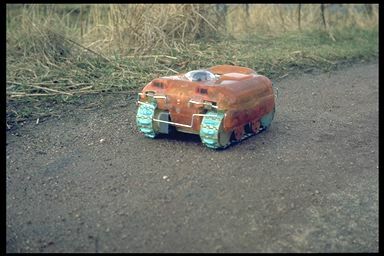 A KYTRON is a small autonomous vehicle. Its name comes from KYBERNETIK (German for cybernetics) and ELEKTRONIK (German for electronics). Another way to define a KYTRON would be as a small electro-mechanical device mimicking some aspects of natural life. What does a KYTRON do? 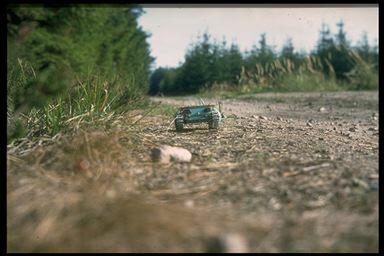 A KYTRON drives around, looks for light and tries to avoid obstacles. With enough light from the environment it is able to reload its batteries using its solar panels. In the dark it is able to follow tiny light sources like torches or even the flame of a match. How does a KYTRON look? 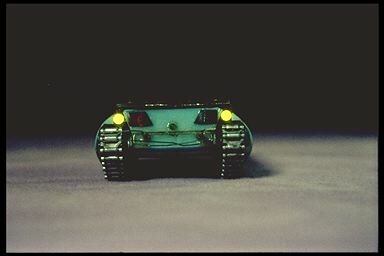 Many people associate KYTRONs with military tanks, at least at first sight. This may be because KYTRONs have caterpillar (crawler) tracks instead of wheels. In fact, KYTRONs have nothing to do with military equipment at all, and are definitively not armed. All five KYTRONs built so far feature tracks, but there is no reason that this will not change. I always had the plan to make one with (six) legs, like an insect. I am not much interested in designs with wheels, but then, this may change when I will see pictures of the new Mars rover. I also have to admit that the Lunachod moon vehicle (8 wheels) of the Russians was a great design. Until now, five KYTRONs were built: KYTRON 1, KYTRON 2, m-KYTRON 3, c-KYTRON 4, and KYTRON 5. In general they became smaller and smaller. Each is introduced below. 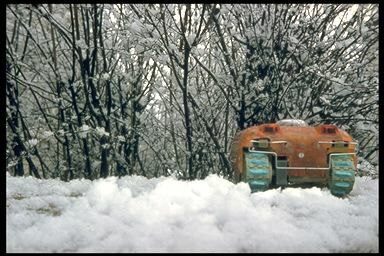 The first KYTRON was done in 1974. The mechanical parts were taken from a toy. 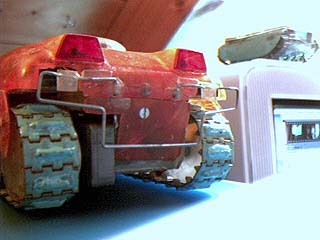 The wheels and crawler tracks were plastic parts. The housing was made from foam plastic. This KYTRON searched for light with three alternative optical sensor devices. The most advanced was a rotating sensor arrangement, using two light sensors looking forward, with an optical shield between them. When either sensor saw light, the motors were started so that the KYTRON would approach the light source. If no light was seen, every 5 minutes the rotor was activated in order to find light in other directions. When such light, f.i. from behind, was detected, the KYTRON would turn the sensor device back to home position and simultaneously would turn itself to face this light source. Then it would approach it as above. The obstacle avoidance capability of KYTRON 1 was very limited. It had a mechanical touch sensor on front. When detecting an obstacle, it would stop immediately and drive back a curve to the right. When trying to approach the light again, it would probably touch the obstacle again, but thanks to mechanical fuzziness it would (hopefully) finally manage to get by. KYTRON 1 was 30 cm long, 15 cm wide, and 12 cm tall. It was destructed in 1977 (see KYTRON 4). Its weight was 1.5 kg and its speed was 24 cm/s. It could operate 30-60 minutes from its Pb-gel batteries. The electronics consisted of about 100 parts, including 1 IC. 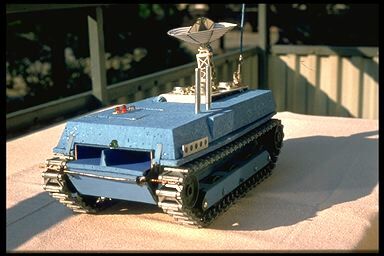 In 1975 KYTRON 2 was constructed. All the mechanics are custom fiberglass parts. Only the tracks were built from small brass hinges, which were soldered together. For interaction with the driving wheel, two notches were added on the inside of each chain link. (This MPG movie clip shows these tracks in detail, 527 K). KYTRON 2 is smaller and uses much less power than KYTRON 1. All logic circuits are realized in the then-new CMOS SSI devices. (The CMOS chips were not only new, but rather expensive too. A simple CD4011 containing 4 NAND gates was 5 DM then.) When stopped, power consumption is less than 10 uA (micro Ampere) at 4.8 V. The mechanical data are: length 19 cm, width 14 cm, and height 9.5 cm, and its weight is 1.2 kg. Its speed is 9 cm/s. The electronics consist of about 220 electronic components, including 19 ICs. This KYTRON has some intelligence when circumventing obstacles on its way to light. It takes the location of an obstacle into account, and remembers its directions in order to master dead ends in a more complex situation (call it "maze" if you like). Real mazes are not handled by this KYTRON, though. An example trace is the following sketch: black are obstacles, yellow is the light source, and red is the trace of the KYTRON. Here is a MPEG movie showing KYTRON 2 circumventing an obstacle. Here is another bigger MPEG movie showing KYTRON 2 in action. The complex rotor device of KYTRON 1 was abandoned in favour of a simpler, fixed arrangement of two optically separated sensors. One looked from front, left to back, the other from front, right to back. This construction proved to be more reliable and very effective. 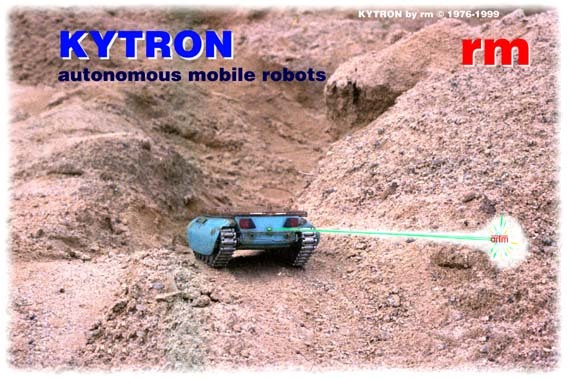 The next KYTRON, built in 1976, is significantly smaller and lighter than its predecessors. It is only 12 cm long, 8 cm wide, and 45 mm tall. Its weight is only 270 g and it is as fast as its predecessor: 9 cm/s. The "m-" in its name emphasises this miniaturization. This KYTRON has 251 electronic components, including 9 ICs. It is the first KYTRON to have solar cells. In bright sunlight these cells deliver enough energy to completely power the logic and the motors. In dimmed light they charge the batteries. In the dark this KYTRON is able to drive up to one hour from battery. The housing is made of fiberglass again, and is water protected. The solar cells are embedded in the clear polyester screw-top. The cast metal tracks of m-KYTRON 3 are running on 14 polyester wheels, the 10 road wheels have full suspension. A short movie clip in MPEG is shown here.Another clip is here. 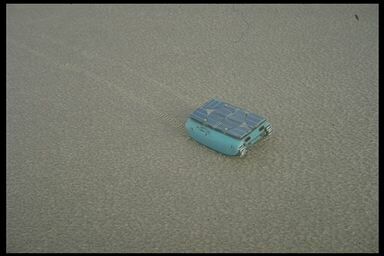 The next photo shows m-KYTRON 3 in a desert. Here is a color movie clip (0.28 MB) showing m-KYTRON 3 following the moving spotlight. 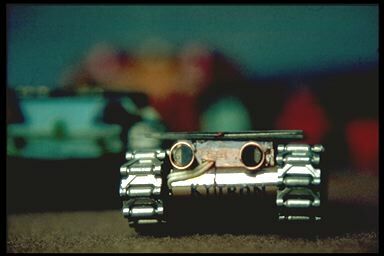 Here is a color movie clip (0.34 MB): m-KYTRON 3 follows the torchlight and crashes with the camera. The initial version of KYTRON 4 from 1977 was very simple and can be left out here. However, in 1980 the logic circuitry was completely replaced by a new design, using the Motorola "ICU" MC14500B microcontroller. This was a step forward: The behaviour of the KYTRON (renamed to c-KYTRON 4) is now controlled by its ICU, a programmable device (one could call it computer), that is, by software. The program is stored in a low power static RAM chip, which is always powered. Programming is done either by typing the program in binary (!) directly into the system, using a simple plug-in control panel. Or one can develop the program on another computer and download it into the KYTRON 4 memory using a kind of direct memory access. The electronics of c-KYTRON 4 consist of about 110 electronic components, including 10 ICs and the microcontroller. The mechanics are rather simple, but efficient. 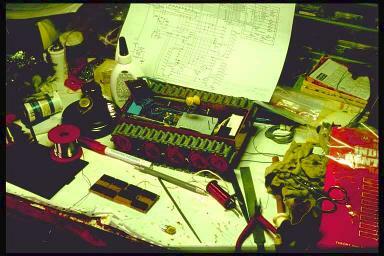 The body was soldered from epoxy print material (same as for circuit boards). The wheels and tracks were taken over from KYTRON 1. The physical dimensions are: Length 6.5 cm, width 5 cm, height 2.8 cm and weight 115 g. Its speed is 9.7 cm/s, faster than KYTRON 2 and 3. It can operate up to one hour from battery in the dark. In bright light, the solar cells recharge the battery. This KYTRON has 131 discrete electronic components, no IC, all squeezed into a space of less than 2 cm3. The logic of this KYTRON, although really primitive, was more consequently designed to search for energy. It has six (gain controlled) eyes, to detect even the slightest chance of a light source. When it successfully reaches the nearest (brightest) point, it stops to let its batteries be recharged. When the light moves away (e.g. a moving sunlight spot in a room) KYTRON 5 follows it immediately. This is shown in this MPEG movie: KYTRON 5 trying to stay under a moving light source. Each week users ask me for technical documentation of KYTRONs for use in their projects. Please note that KYTRONs, while fascinating in some way, are quite dated today, built with 1975-81 technology as homebrew hobby projects. I cannot imagine how any industrial project could profit from the ancient, hard to read documentation of my KYTRON SYSTEM. But anyway, for the curious, here are the circuits as hand-sketched schematics (legends in German, hard to read), scanned at 200 dpi and converted to GIF. There is one GIF file for each of KYTRON 2, m-KYTRON 3, c-KYTRON 4, and KYTRON 5. Each file is roughly1 MB in size!!! This is the circuit of KYTRON 2. This is the circuit of m-KYTRON 3. This is the circuit of c-KYTRON 4. This is the circuit of KYTRON 5. You should download then print these files at 200-300 dpi on a good printer, on the screen they are hard to read. As explained earlier, c-KYTRON 4 uses a software controlled M14500B ICU. Here is the hand-written listing of the latest version of the K4 software. You should download then print this file at 600 dpi on a good printer, on the screen it is almost impossible to read. Columns 7 and 8 of the above listing are available in electronic form (ASCII text) too. New: Because the hand-drawn schematics are mostly labeled in German, and use the old European symbols for logic gates and electronics, now I provide a legend of used symbols and German words. There is a CLIM/Common-Lisp-based graphical simulation program for KYTRONs. The Lisp source code of the simulator may be used as a first-time tutorial for CLIM as well. A simpel Java applet simulator can be found here. This one is a Java applet, so you need a Java-enabled browser like Cyberdog 2.0, Netscape 3.0, Internet Explorer 3.0 or newer to view the simulator applet. Now I have a page with ideas and hints about constructing your own Autonomous Mobile Robot yourself. Created by rm using HTML.edit and MacWeb in 1992. Some editing with BBEdit lite w HTML extensions. Some editing with HTML Pro 1.08. All b/w movies created with the original Connectix QuickCam. All color movies created with the Logitech QuickCam Pro. Page originally published since Sept 1993.
Who sits on my Computer?